There isn't a day that goes by where girls aren't dreaming about a dominant man entering their life. It's the theme of many of Hollywood's best movies and if you play your cards right, you can play the dominant role in your own story. According to some studies, nearly 70% of girls want to be involved with a dominant male and this study represents women of all ages. The truth of the matter is that dominant men tend to get what they want more often than men who act in submissive ways. And if you don't believe this, just take a second to look around that the guys who are literally running the world. Most of them are assertive dominant males and they got to where they are because of their dominant behavior whether instinctual or learned. Fortunately, you don't have to be born with an excessive amount of testosterone coursing through your veins to become a dominant man. And like everything else that you've always wanted to be in life, the behavior of a dominant mate can be learned. 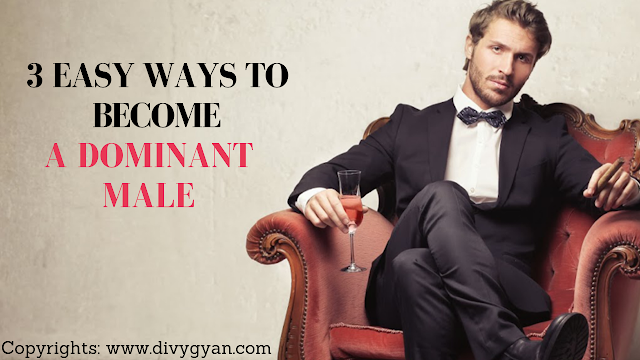 Displaying dominant behavior is an excellent tool for making girls more attracted to you. But it's even more effective for becoming more successful in all other areas of life. Now the first simple tip to becoming a more dominant male: is to be the leader. In every good action movie, there is always a good leader. In the latest Mission Impossible movie, the main actor Tom Cruise leads his crew to victory and even when the mission seems impossible. His crew note that they can count on him to carry them through it. All girls want the same thing. When every year-round girl be the leader and try to decide what everyone will do. Girls like it better this way because they just want to enjoy the ride with you regardless of where you choose to steer the boat. Put simply be the guy with the plan whether it's what you're going to eat tonight or what movie you're going to see in the theaters. Be the guy at work who has the plan that will carry the team to success. In football, the quarterback is the most important player on a football team and the reason for this is because his decision has the greatest most direct impact on the outcome of the game. They are the guys who lead the rest of the team to a win. Tip number two: Is taking control of situations. What are the most effective ways to become a more dominant male is to start taking control of situations that you're involved in? The truth is that most people go through their entire life reacting to things. When they plan a vacation and the flight gets canceled they just give up and go on vacations some other time, instead of taking control of this situation in making it work. A male who's dominant takes control of the situation rather than letting it take control of him. For example, if you're broke right now and your finances are terrible and you're doing nothing about it, you're letting the situation take control of you if you know your true value and you're not getting paid what you deserve to get paid then once again you're letting the situation take control of you. Pretty much all girls love it when a man takes control of the situation, whatever it may be. Now the third tip to becoming a more dominant male is probably the hardest because guys do this all the time but it's also one of the best least talked about things that guys can start doing right away. And it involves the way that you talk. I've mentioned in previous articles that everything you do, including how you speak it gives off clues about your character and there are three little words that you'll almost never hear from a dominant male. These words are: "I don't know" As mentioned earlier, the dominant male is the guy with the plan the one who makes the decisions. Imagine what would happen if the football team asked the coach, what play to use? And he just stood there and said well, I don't know! When a girl asks you what color shirt wear, don't say, I don't know! It's up to you, just pick a color. A guy who ends every other sentence with "I don't know" is giving off a huge signal to everyone around him telling them that he's not a dominant male. Because he can never make a decision for himself let alone anybody else. Scientists used to think that our brain is a digital computer but they've come to realize that it's actually a massive learning machine capable of being molded into whatever you want it to be. These simple tips if implemented into your life immediately will help you to become more dominant not just with girls but with everything in your life. Tags : "alpha male" "attraction psychology" "attraction" "atttact girls" "beta male" "dominant man" "dominant" "how to be alpha" "how to be confident" "how to become dominant" "how to"